I saw this on a church sign while driving home from the store and it is absolutely true. I’ve been looking at the wait in a whole different light this week and all it took was a simple quote to hit home. We’ve been through a lot in the last 3 years to give up now. So much paperwork and SO many scammers! It was especially hard on us when K miscarried because I’d grown so close to her and looked forward to talking every day. It wasn’t easy getting over what happened, like it happened to us, well it did but indirectly. No one knows what to say about such things in the everyday but much less so in adoption. It’s a tough hurdle and it took me a lot of time to make peace with. However, I’m back and looking forward to growing our family through adoption. They say everything happens for a reason and in the right time so I’m trying my best to embrace that. I’m hoping to have a similar relationship with our expectant mom where we both look forward to daily chats and hopefully it can grow into more of a sisterhood of shared experience and love for each other and the child. I’m so thankful to our support system, especially my best friend, who herself is going through so much right now but she’s always there, as I am for her. I can’t imagine trying to go through an adoption alone without support of family and friends. I hope our future birth mom will have that support as well but if they don’t I hope they know they have IAC and us as their champion for support before, during, and after birth. So no more conscience cloudy days for me I WILL regain my sunny disposition and continue forward to our dream of becoming parents. Open Adoption: What is it and why we chose it and our agency. We’ve been asked a lot about how open adoption works, why we are waiting so long, and aren’t we worried about contact after placement. Most recently we were asked about adoption and our agency from an expectant father who called us looking for an agency and asking questions on how to place. 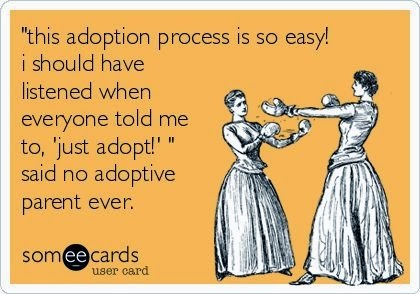 So the basics of a modern adoption are that the expecting parents choose the family. We aren’t on some numbered list of the past where we get a call from the agency to pick up a newborn. However, there is a last minute hospital list we aren’t eligible for but again the family is chosen by the birth parents. The open part of the adoption is different for every family. It is outlined into an agreement with the agency, expecting parents, and hopeful adoptive parents to meet the needs of all of us. Some families have lots of contact, some only want letters and pictures or Facebook updates. This is one of the more important aspects of the open adoption. Our agency always reminds us not to go overboard with contact but be realistic when it comes to being able to maintain that level of contact for years to come. You can always see each other more often than stated in the agreement but if you over promise it can damage your relationships. We agree with that. We want as open and realistic adoption plan as possible but it has to work and be comfortable for the expecting parents as well. So in an open adoption is it co-parenting? No it isn’t. It’s about the birth family getting updates and seeing how happy and loved their child is. Adoption is a choice made out of love for the child and wanting the child to grow up in a stable and loving environment that the birth parents aren’t in a position to provide at this point in time. The child grows up knowing about his/her adoption and any questions he/she may have as they grow up they can ask their parents or their birth family. There is less confusion and angst when the child grows up knowing why they were placed and where they come from and who do I look like. Many families who have adopted through our agency say the birth family is an extension of their own family. So we chose open adoption but why did we choose IndependentAdoption Center in California instead of an agency in our home state? They are ethical, advocate for birth parents, and explain all options. They have offices in 8 locations around the US not just California. They have lifelong counseling if needed by anyone in the triad (birth parents, adoptive parents, or the child) and I like that the social workers are different for hopeful adoptive parents and expectant parents. They have also been around a long time being one of the first agencies to advocate open adoptions and don’t discriminate. Anyone eligible to adopt can adopt through them. Other agencies we researched can and will say no to single people, LGBT, and religious differences among other things. We prefer equality for everyone. So why are you waiting so long? This is a hard one; we are like all the other waiting couples hoping for that perfect match. For us we have had a few contacts that didn’t work out (one chose to parent, one went with another couple and one had a miscarriage so you just never know how things will turn out). We keep on waiting, hoping, and someday we will be parents if we remain patient with the process. The right person will see our profile and we can move forward but until then waiting is all we can do.